It’s been a long cold winter and you’ve been cooped up inside trying to stay warm. Meanwhile, your boat has sat in storage unused for the last several months. 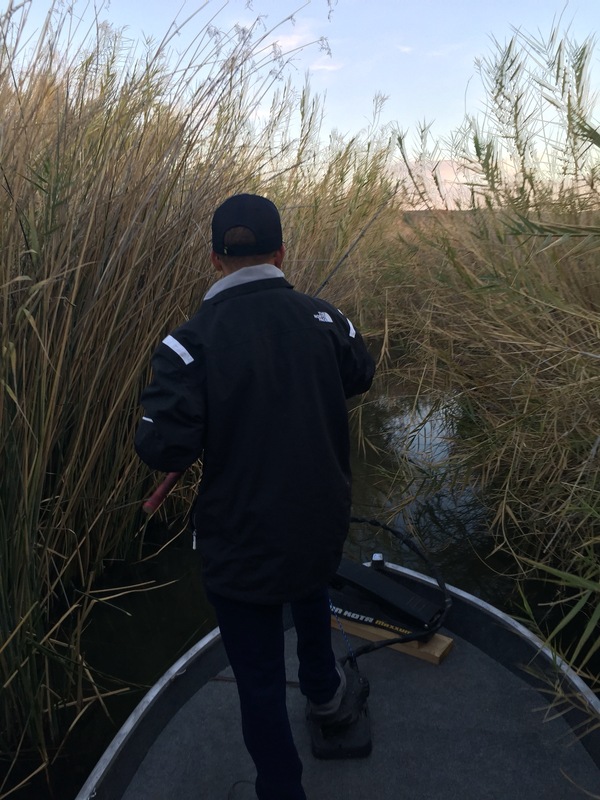 Hopefully when the time is right and you’re finally able to make it out to the water for the first time of the season, you’ll have taken the proper steps to ensure that your first trip is an enjoyable one without the dreaded trouble that comes from boat ownership. It has been said that boat is short for Bust Out Another Thousand and while that might be true in some regards, proper preseason care can save you money and keep you on the water. If your motor is a 4 stroke, now is a good time to change your oil. It is recommended by most manufacturers to replace the oil every 100 hours or annually whichever comes first. For most recreational boaters, the annual mark will come well before the 100 hour mark. You should also change all of your filters (oil, fuel, fuel/water separator). All of these things are easily done on your own, but you should follow the guidelines set forth in your owner’s manual. If you did not change your lower unit fluid before storing your boat, you should change it as well. I prefer to change it before winter in case there is any water in the fluid. The water will freeze and can cause damage to your lower unit. While servicing your oil and replacing your filters, you should check for leaks. If you find any fuel or oil leaks you’ll want to investigate the cause and fix the leak before using the boat. If you’ve kept gas in the tank all season, it wouldn’t be a bad idea to drain the tank and add fresh gas. This could potentially save you hundreds of dollars and a lot of trouble. Gasoline today will break down and start gunking up. It will turn to jelly and clog your fuel injectors or carburetor and potentially leave you stranded on the water. Make sure your batteries are fully charged. Hopefully, you have kept them on a battery maintainer all winter and they have stayed fresh and ready to go. If not and you live in a really cold environment, hopefully you brought your batteries inside out of the cold. Either way, before hitting the water make sure they are charged and if they are serviceable batteries make sure to top them off with water. Let’s face it, we operate our boats in an environment that is prone to corrosion. Corrosion costs boaters around the world thousands of dollars a year, but with proper preventative measures is easily mitigated. Prior to the start of the season, disconnect all of your electronics and clean the connection with an electrical contact cleaner such as CRC 5103 Quick Dry Electronic Cleaner (http://www.amazon.com/CRC-5103-Quick-Electronic-Cleaner/dp/B000BXOGNI/ref=pd_sim_328_2?ie=UTF8&dpID=411CvV4yAwL&dpSrc=sims&preST=_AC_UL160_SR160%2C160_&refRID=120GY3F0QT3CJMCGRQMR). The grease spray will keep moisture out of your connections and keep them free of corrosion, giving you that piece of mind that when you flip the switch, your equipment is going to turn on. Light bulbs go bad, they burn out or simply break. Prior to using your boat, verify the integrity of all of your lights. 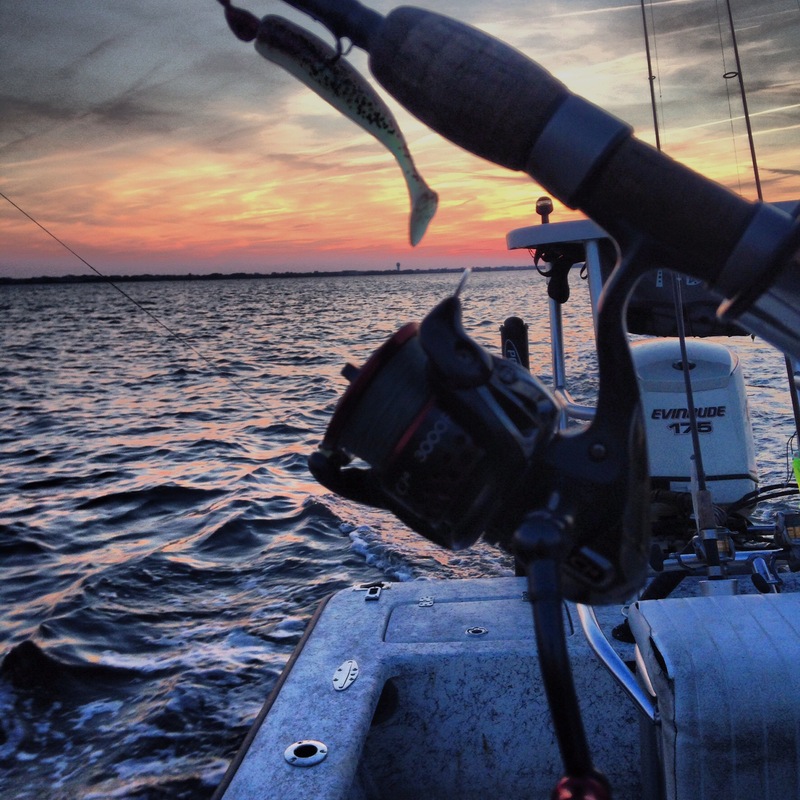 If you find lights that are burnt out, replace the bulbs before hitting the water even if you don’t plan on using your boat before or after sunset, Murphy’s Law always has a way of prevailing and it’s better to be safe than sorry. Don’t forget to give the light housing a squirt with the CRC Electronic Cleaner and then the CRC Di-Electric Grease. Personal Flotation Devices for everyone aboard-Ensure that they fit and are serviceable. If the straps or buckles are torn/broken then replace it. A throw able flotation device- check for serviceability, if there are tears or cuts then replace. Horn or whistle- I encourage you to carry a whistle even if your boat is equipped with a horn. Revert back to Murphy’s Law. Some laws also require you to carry flares as well as a first aid kit, both of which I highly recommend. 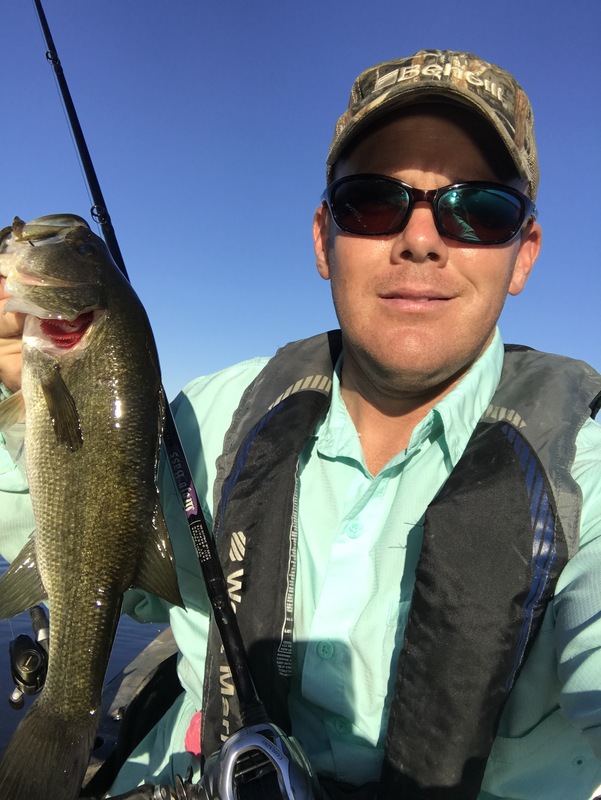 I headed out to Mittry Lake this weekend with the intent to learn how to flip for bass from the kayak. I had previously been concerned about my low position to the water and how hard it would be. Within the first 10-15 minutes I had the technique down pretty good and my confidence was pretty high, even though the only other time I’ve ever flipped before was with a friend in his boat last summer. 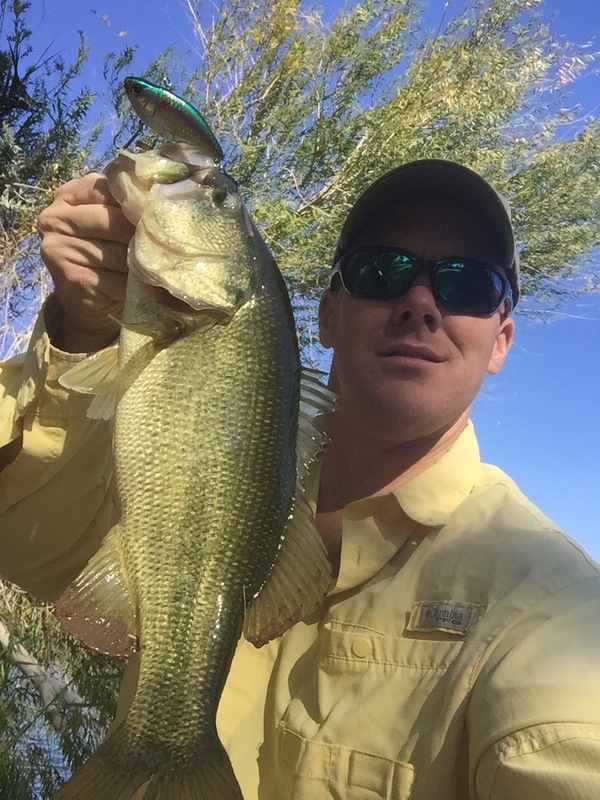 Rigged up with a zman palmetto bug in green pumpkin, and confident in my newly acquired ability I headed to a stretch of water where I’ve had a lot of luck in the past with throwing a frog. On about the third flip, I felt a solid thump and set the hook. 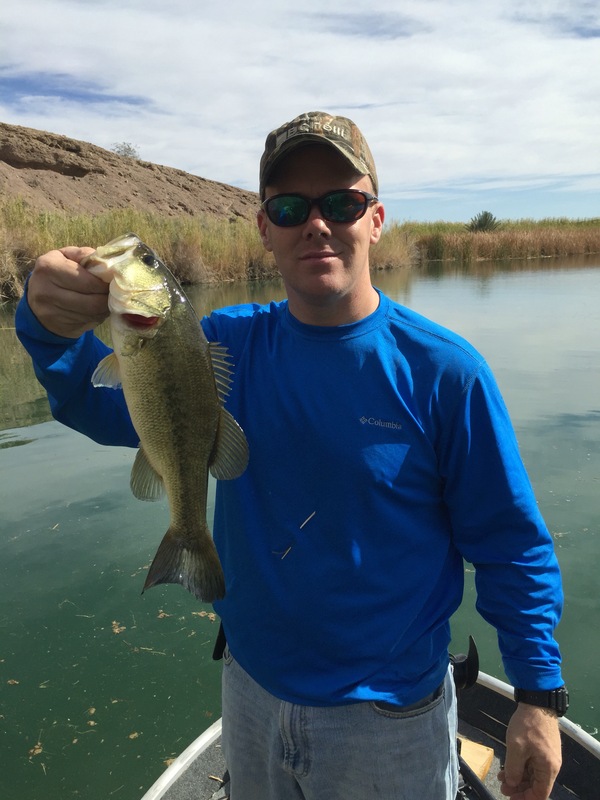 The rod came tight and it felt like a decent fish, but quickly pulled off. I then realized that I was nowhere near manly enough with my hookset. I pretty much just lifted the rod like it was a crankbait bite. Oh well, lesson learned. I pick that stretch of grass apart over the next hour, and ended up putting two in the yak before calling it a day. While I didn’t burn them up, it was a great learning experience and I am looking forward to getting out and applying what I’ve learned again in the near future. Was blessed with an opportunity to finally get back to NC to spend time with family and on the water after being away for 8 months. The majority of my time revolved around spending as much time as possible with the kids on the water. That said, one night while home around 10 pm my better half tells me that I should wake up and go fishing by myself until early afternoon. The kids hadn’t done their school work in a couple of days (homeschool is awesome) and needed to catch up. 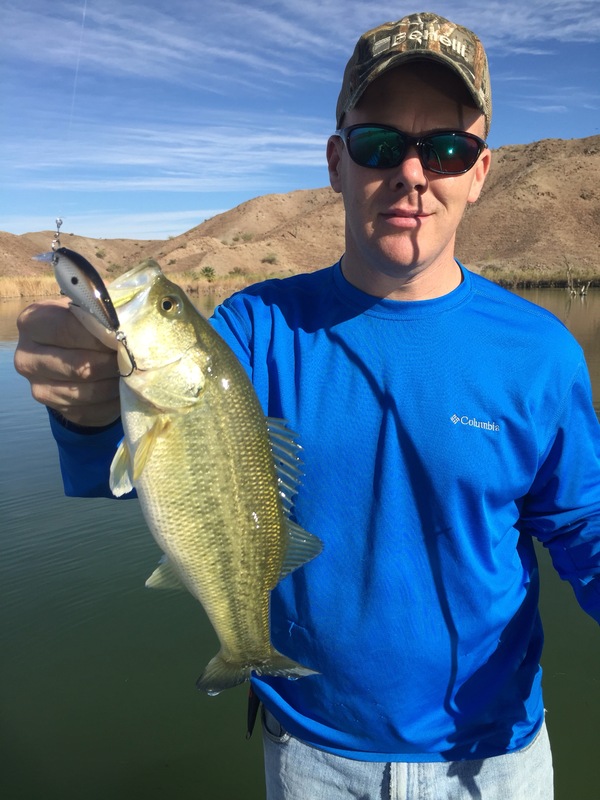 Not one to argue with the boss, I woke up the next morning with the intent of fishing a lone for a little while after I picked up a gallon of XD100 for the boat. 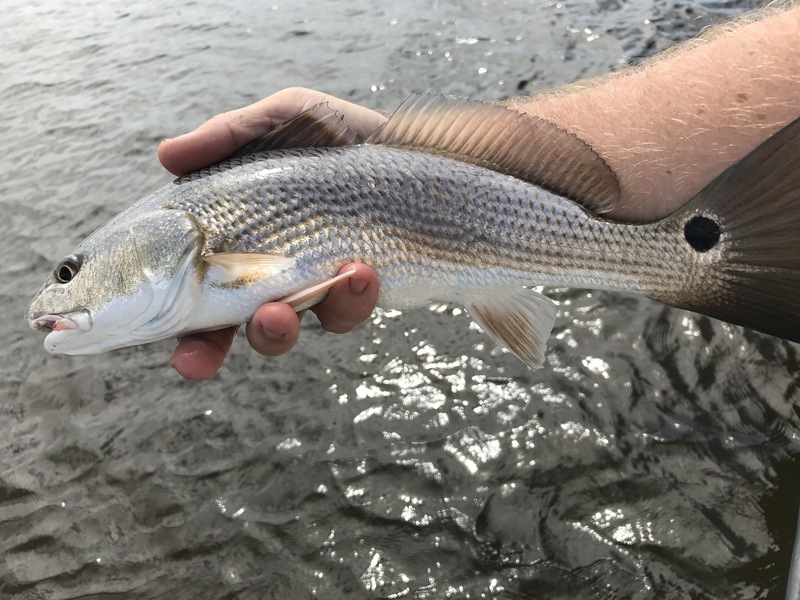 I had plans of going to Beaufort and seeing if I could find any reds to play with. I’d had the kids out and had them on rats (report to come on that soon) but I wanted some bigger fish. I woke up around 7 the next morning to get ready so I could be at the store by the time they opened at 8 to get my oil. It was then that I remembered my good friend Steve is retired and unless he was already fishing would be willing and able to go. So I gave him a call and low and behold his boat was in the shop for routine maintenance and he was available to fish. After a quick conversation, we decided to meet at the ramp around 9 am. 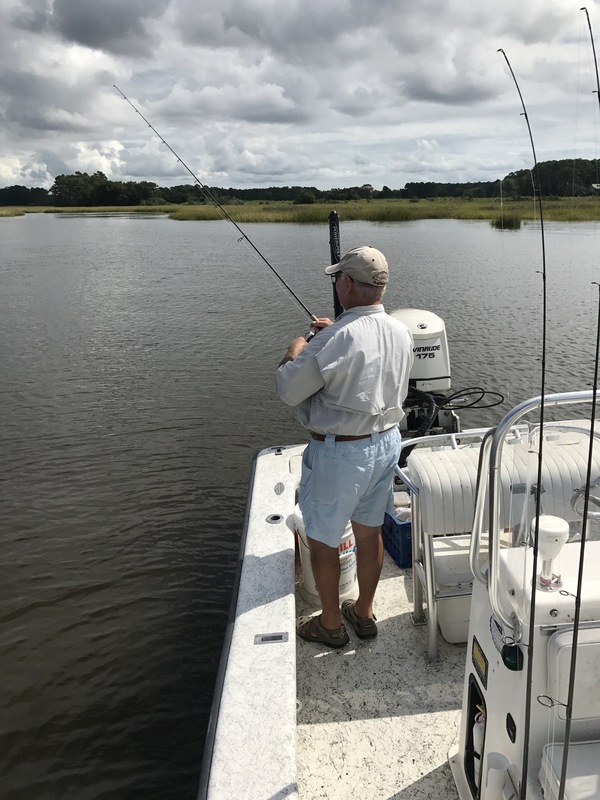 We splashed the boat and headed out in search of a few gray trout while waiting for the tide to get right and found what we were looking for, though they were picky and had a strong preference for my sting silver over his (I think he was being nice since I hadn’t fished in a while). Once the tide got right, we decided to go in search of Mr Redfish. We found them and quickly put 10 or so in the boat, but they were all rats. While fun, they were not what we were hoping for. 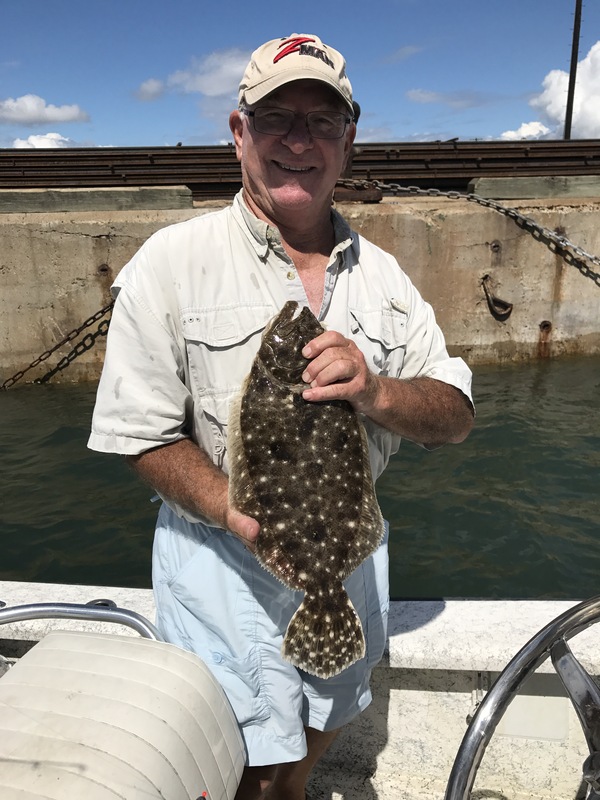 Running out of time to make something awesome happen, I decided to hit the port wall in hopes of a few flounder. It didn’t take long to fill the bait well with good sized finger mullet, and we got setup to drift for flounder. 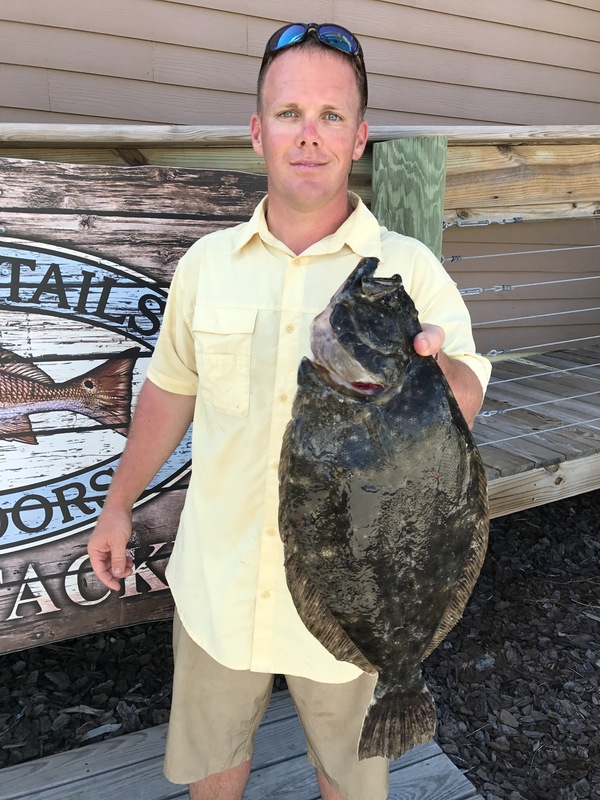 On the first drift, Steve came tight with a good fish and we finally had something to stink up the cooler with. Next it was my turn, but this one was a tad smaller than Steve’s though still a legal fish at 16 inches. Steve then put another one in the boat at 17 inches, and it was my turn again. 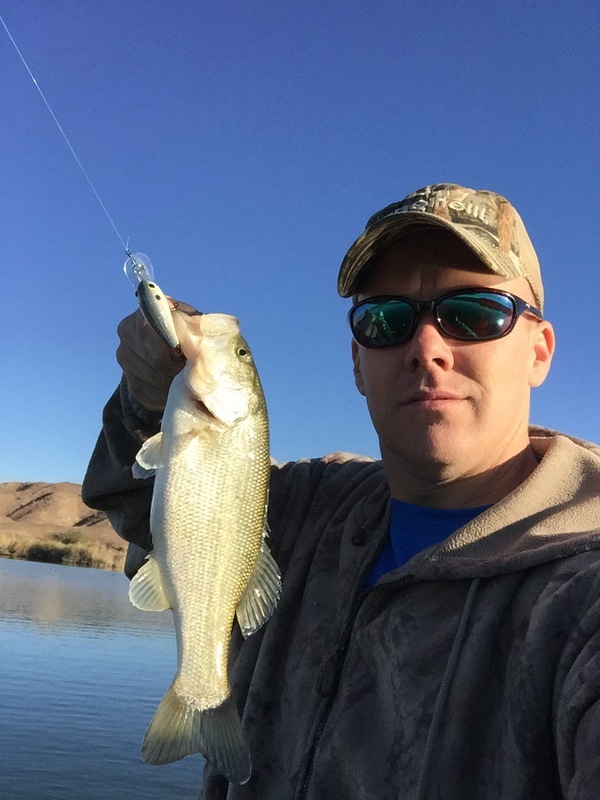 I felt the thump and knew right away it was going to be a good fish. Using live finger mullet 6-8 inches long I had to give her a second to eat. I waited about 3 seconds and checked to see if she was still there. 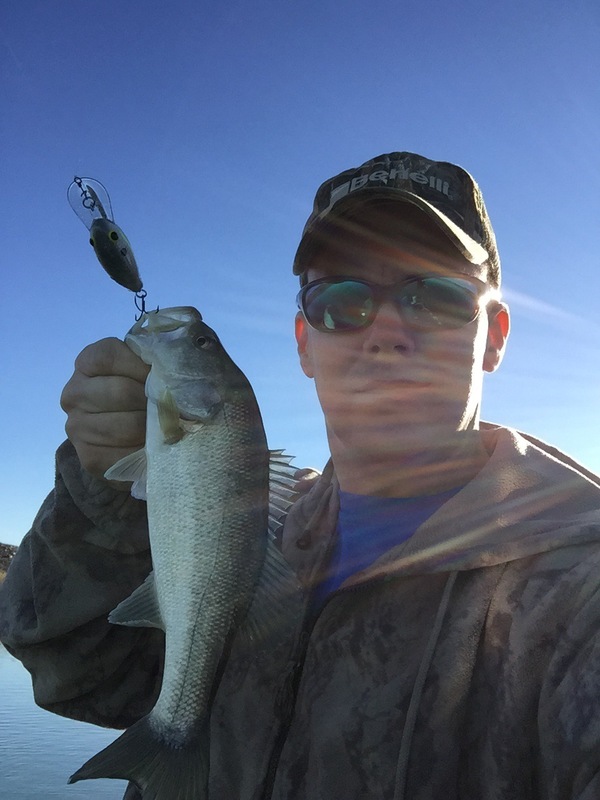 I slowly lifted my rod tip and felt it pull back. I lowered the rod, taking up slack and then let her rip! At first, nothing budged and Steve thought I was hung. I knew better. This is a good fish, get the net! After a few moments I saw color. 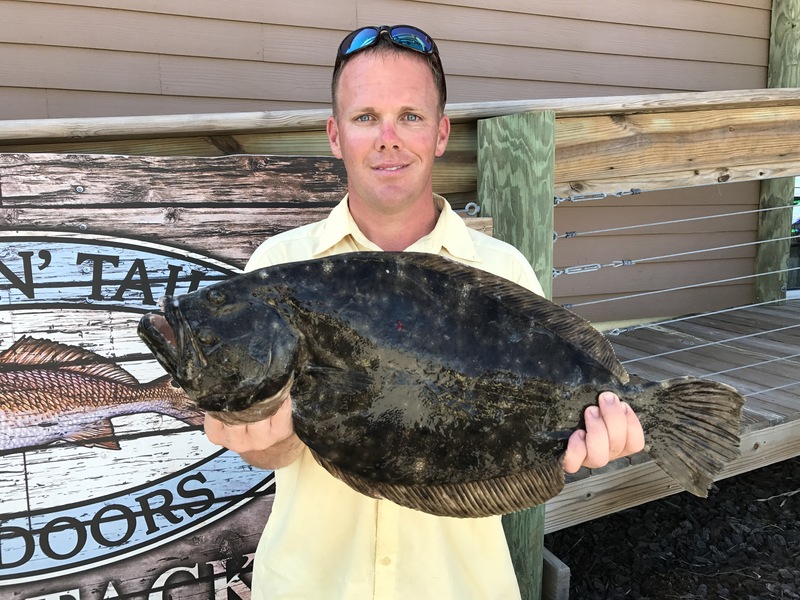 She rose to the surface and her head tried coming out of the water but Steve made quick work with the net job and I had my largest flounder to date in the boat. I took it to Chasin Tails for a weight after the trip and she came in at 6.94 pounds. 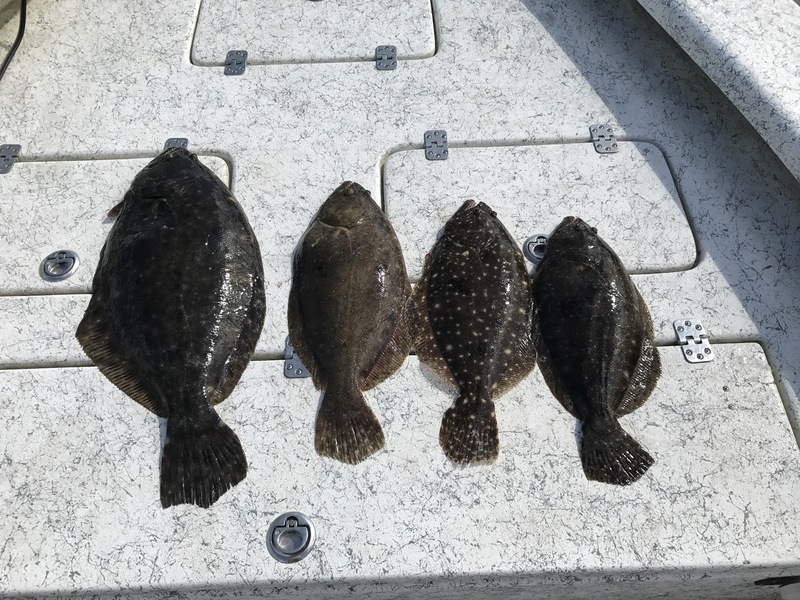 We finished the trip shortly after that fish as I’d already pushed my window to get home to the family, but we managed 4 nice flounder. 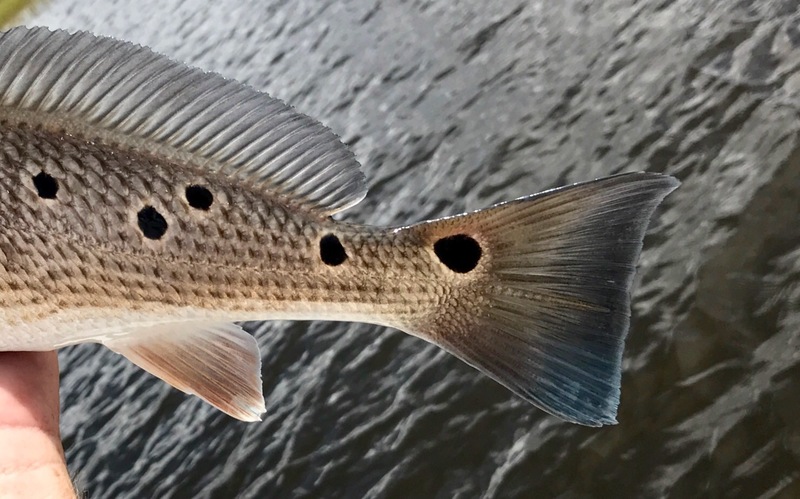 We fished the first hour of the falling tide and used live finger mullet on Carolina rig as bait.